The Splash And Fun Dog Pool is a special dog pool, made from extra tough PVC and suitable for every dog. The pool has an anti-slip bottom to prevent your dog slipping. The pool does not need to be inflated and can easily be folded after use. The Splash And Fun Dog Pool from AFP is a pool that has been specially developed for dogs. The swimming pool is made from extra strong PVC, making it very sturdy. In addition, the swimming pool has an anti-slip bottom, meaning your dog is less likely to slip. Thanks to the special design, the swimming pool does not need to be inflated and once summer is over, you can easily fold and store the pool. With this special dog pool, your dog can cool down safely and responsibly, under supervision, on warm summer days. Splash And Fun Dog Pool - S: diameter of 80cm and the edge is 25cm high. Splash And Fun Dog Pool - M: diameter of 120cm and the edge is 30cm high. Splash And Fun Dog Pool - L: diameter of 160cm and the edge is 30cm high. 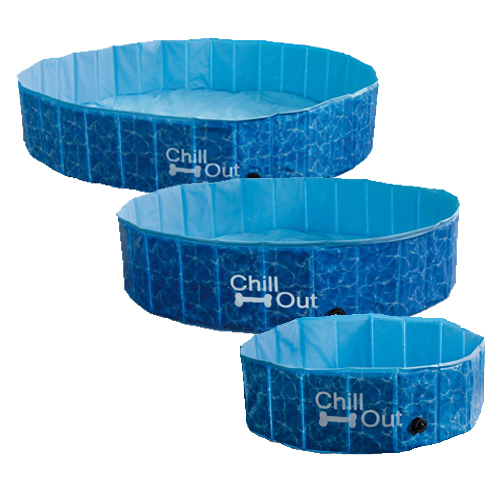 Have you used AFP Chill Out - Splash And Fun Dog Pool before? Let us know what you think about this product.